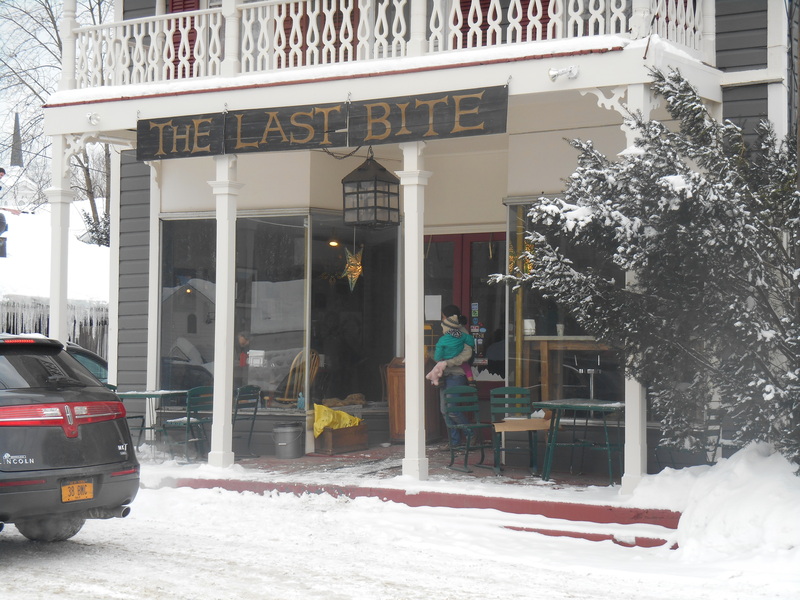 I discovered The Last Bite when living in Tillson, a hamlet in-between New Paltz and Rosendale. I lived in Tillson with people who were really into breakfast. They were late risers, so breakfast was more so defined by the kinds of food involved, as opposed to whether they were actually consumed in the morning. Tillson doesn’t really have any breakfast spots, so we would have to travel a town or two over to sate our hunger. 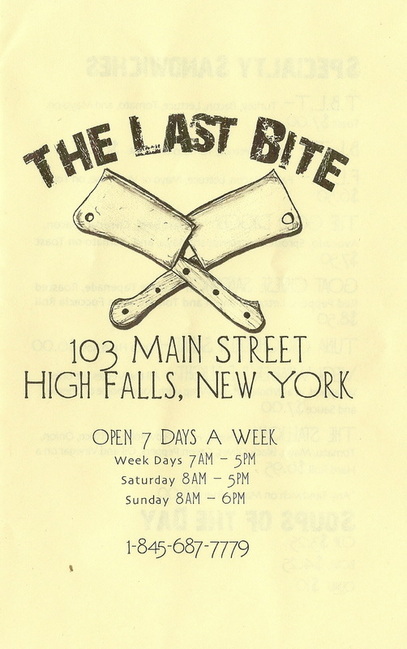 One of our regular spots was The Last Bite in High Falls. High Falls is officially designated as a hamlet, a little wink of a place that is officially part of both Marbletown and Rosendale. Its population is 627, according to the 2010 Census. There’s a lot of older people in High Falls, as well as families with young children. Even though High Falls is technically ‘over the ridge’ — meaning that it is West of the Shawnagunk Mountain Range — it doesn’t have that run-down, Red-State feel to it. It’s less than a 20-minute drive to Kingston, so I suspected most of the middle-class denizens are commuters. 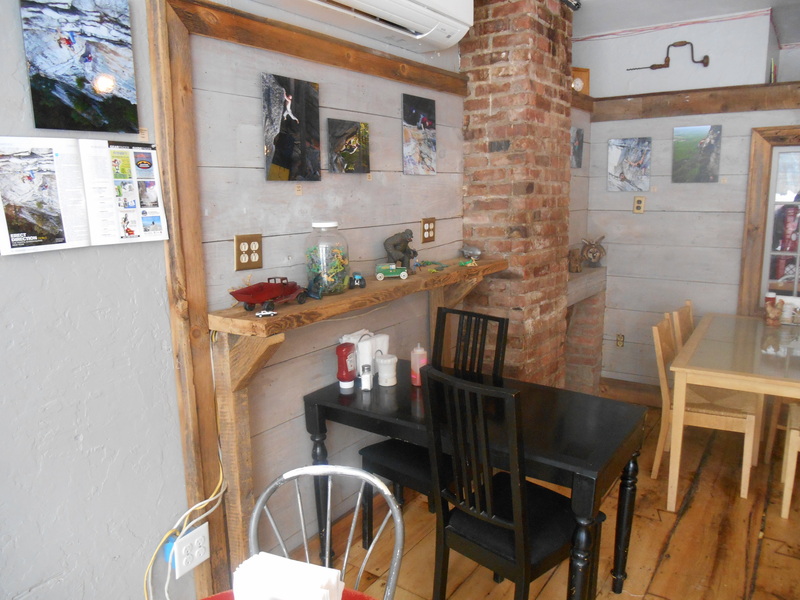 The place had a bohemian feel to it — the rural version of hipster. Sundry chotchkies and a few children’s toys adorned shelving on the far wall, and a cluster of antique meat cleavers were displayed near the bathrooms. There was a series of photographs featuring climbers. According to the Barista, different artists and photographers were featured each month. If you purchased the art, 90% of the profits went to the artist, and the other 10% went to the Rosendale Food Pantry. The Last Bite didn’t take anything off the top. “We occasionally sell stuff,” said the Barista. The Last Bite boasts a variety of breakfast baked goods, but I had decided on lunch, so I moseyed up the the counter to order “The Stallion,” a green and black olive-festooned salami sandwich. As I waited, I glanced out the window to see Scott Albright, the owner, arrive with the bed of his pick-up stacked with supplies for the restaurant. The Barista never said it was free, but I pumped myself another cup anyway. I’m not going to say the sandwich was delicious. I am going to say that it was tasty enough for me to finish, which is saying a lot for a person who rarely eats before nightfall. Sarah got “The Hungry Hipster,” an explosion of traditional breakfast sandwich components. We exited the shop while waving goodbye to the Barista. The Last Bite was definitely the type of place where you wave goodbye to your server. Being from Marbletown, and a former New Paltz graduate, it is pretty offensive to imply that anywhere west of Mohonk is run down. Unless you may be referring to Sullivan County, which is one of the poorest counties in New York, that is a very ignorant, and rude statement. 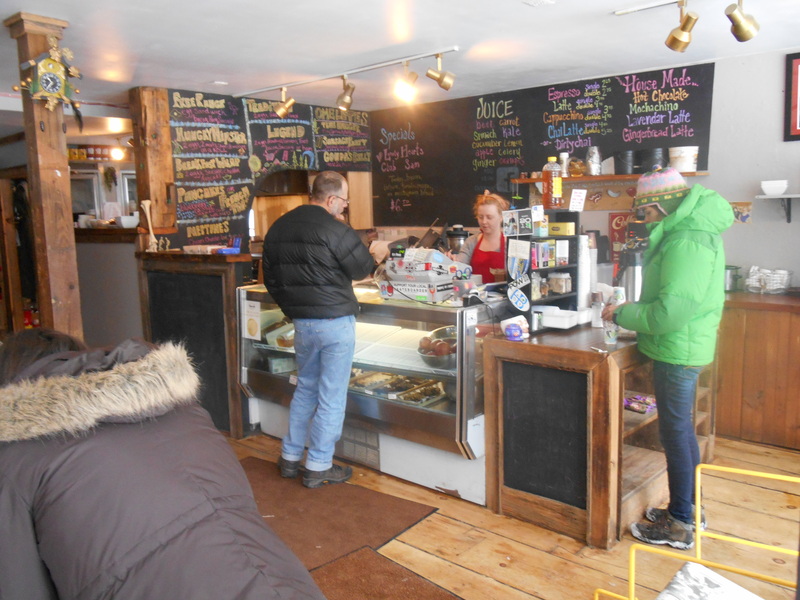 High Falls and Rosendale are filled with spillovers from New Paltz, so a place like the Last Bite would appeal to you, but that is not how most of the area is. It is very rural, but there is an interesting mix of “artsy liberals” and what I like to call “down home conservatives” That doesn’t mean it is run down, and being a red state doesn’t make somewhere a bad place. That line is a perfect example of the liberal crowd looking down on people that don’t live the same lifestyle as them, and it is perfectly allowed, but it is a form of hate and discrimination that is freely thrown around. Maybe next time you venture over the scary mountain, visit a place like Benny’s Pizza or Jack and Lunas to get a real feel of the run down area.